A founder or leader of a local chapter is usually referred to as a “Queen”. 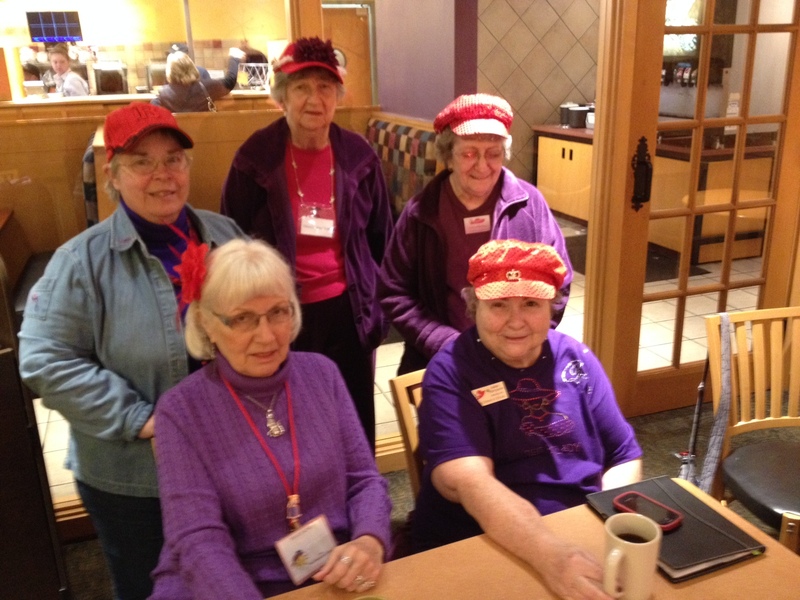 Members 50 and over are called “Red Hatters” and wear red hats and purple attire to all functions. A woman under age 50 may also become a member, but she wears a pink hat and lavender attire to the Society’s events until reaching her 50th birthday. She is referred to as a “Pink Hatter.” During her birthday month (or the Society’s birthday month of April), a member might wear her colors in reverse, i.e., a purple or lavender hat and red or pink attire. There are two ways of belonging to the Red Hat Society: as a Queen (usually leader of a local chapter; however, no Queen is required to lead a chapter) and as a Supporting Member. Membership dues are paid annually, respective to the attendee’s role, to the Red Hat Society. Interested prospects can register to become members online. Listen as Queen Maryann Calhoun tells us about the Red Hatters in Butler PA. This entry was posted in Uncategorized and tagged Pink Hat, Red Hat, Red Hat Ladies, Red Hat Society. Bookmark the permalink.